If you know our family, then you know that we bike quite a bit. If you don't know us...well, we bike quite a bit. Now that our 5-year-old daughter is tall enough and can stay awake long enough on a bike, she has joined the ranks of pedaling with the rest of us. We invested in an Adams Tandem Trail-A-Bike this year for family rides. We usually take it behind our real tandem. It's a train, but it's a major improvement over the train we hauled up the mountain last summer. And yes, that is a kid in a cast in the photo below. And yes, that is a dog in the trailer. 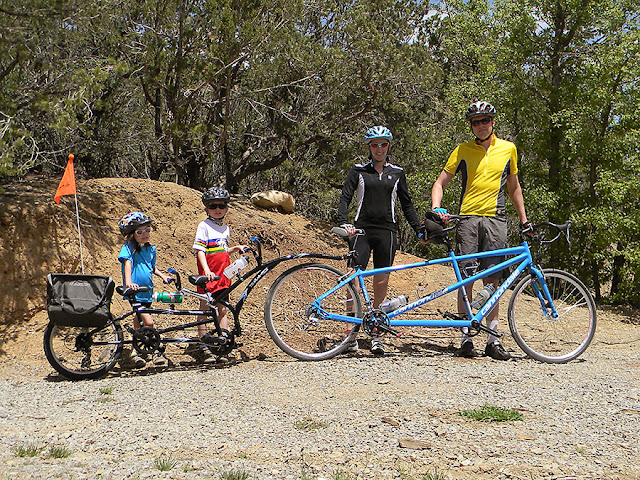 So we can fairly compare a trailer, a single trail-a-bike, and a tandem trail-a-bike. We're familiar with all of them. In order to do a fair review of this trail-a-bike, Biker Boy also hauled it behind a single bike. I have yet to do that, but this mommy will try it soon. Update: I have since tried to tow the two kids on the tandem trail-a-bike behind my mountain bike. It was a huge failure. I couldn't even keep the bike up for 3 seconds before it fell over. I saved us from a near disaster and the kids were very brave! I never even got my second foot up on a pedal. Biker Boy figured I wouldn't be able to do it, but didn't tell me, he just let me try. The tandem trail-a-bike and the two kids weigh much more than I do. You need to be bigger/heavier and a good biker handler to handle the tandem trail-a-bike. I'll start with a quote from Biker Boy: "It's like hauling a load of squirming bricks up a mountain." To be fair, we currently ride with the two kids up the mountain near us. We leave the dog home for that. The kids are like a turbo boost button. When we tell them to pedal, they'll give us a good 30 seconds to a minute of hard pedaling and will greatly accelerate us. After that they die off and pedal lightly until we tell them to pedal hard again. We do have a disc brake on the rear of our tandem and a front rim brake. If you're riding in the mountains with a trail-a-bike you want to make sure you'll be able to stop with all that weight behind you. Adams is the manufacturer of both our single and our tandem trail-a-bikes. On both trail-a-bikes they have a universal joint on the boom of the trail-a-bike and a receiver hitch that clamps on the seat post of the lead bike. The universal joint and the receiver hitch get a little sloppy with time. This translates into a little side to side movement. You'll be able to feel when the kids do side to side movements. Sometimes the driver of the main bike will have to compensate for those movements. Biker Boy says there is not much difference between pulling the tandem trail-a-bike behind a single bike or a tandem bike as the lead bike. We often have to remind the kids to stay still and even demonstrated to them how to keep their upper bodies still. We especially like them to not move side to side when we're near traffic or going down a hill fast. The kids' pedals are linked together with a timing chain. The captain (head of the bike) and the stoker (rear of the bike) have to work together. Scooter is our captain and Chewy is our stoker. The first few times out Scooter would start pedaling or would back pedal without letting his stoker know. Chewy got hit in the shin hard by a pedal a couple of times. The tandem trail-a-bike's pedals seem to be closer to the ground than they are on the single trail-a-bike. Scooter has hit his pedal on the ground a couple of times, mostly on speed bumps and when we go around corners. We have him try and follow the lead biker's feet when going around corners. It's good practice for Scooter to follow us since he should always have his inside pedal up when going around a corner. We could also probably remedy the situation by putting the hitch up a little higher on the seatpost, but there isn't much room to do that on ours. Chewy (our 5-year-old daughter) was just tall enough to reach the pedals on our single trail-a-bike this year. She's just over 40 inches tall. She fits much better on the rear of the tandem trail-a-bike. There is less distance between the saddle and the pedals, so she's much more comfortable pedaling that. She can also reach the handle bars much more comfortably on the tandem trail-a-bike. You can make adjustments to the saddle height of both the captain and stoker by moving the seat post up or down. The stoker's handle bar can be moved out or in. If you'll notice in the photos, we have it in all the way towards the captain's saddle and Chewy is pretty much sitting straight up and holding the handle bars. The only adjustment we could make is to move the handle bars closer to her, but that would be getting too close. Our tandem trail-a-bike has a seven speed shifter that the captain controls. We often tell Scooter (our 7-year-old son) what gear he should be in. We'll tell him to go into "one" when we're going up hill and into "seven" when we're going down and somewhere in between when we're on flats or a slight hill. He's got a geared bike for his single bike and is getting much better at knowing when to shift the gears. There are no brakes on the tandem trail-a-bike. That may be obvious to most, but we have had people ask us if there is a brake on it. And yes, we get asked lots of questions about the bike. So if you have any, please comment and ask. And yes, we get lots of cheers and laughs (probably because of the dog). We've even had people ask to take our photo. I guess a tandem trail-a-bike isn't that common. Our tandem trail-a-bike was the first one our local bike shop had ever sold. They were pretty stoked to see one. Overall, we're very pleased with the tandem trail-a-bike. It works for us and lets us get out on the bike together as a family. Since our kids are still small this will work for us for a little bit. Some day we'll probably get another real tandem and use an extension kit for one of the kids if we need to. Rather than spending a lot of money on a real tandem, it was less to get this trail-a-bike. But it's still not cheap. We're pretty sure we won't have trouble finding someone to buy it used from us since we know quite a few other tandeming couples with two or more little ones. The most important thing is: THE KIDS LOVE IT!! They love riding the tandem trail-a-bike together and with us. We got out at least once a week together. Maybe they just love that we go for ice cream when we're done, but oh well. They are great little pedalers! We ordered our trail-a-bike from a local bike store. It's the same store where we got our real tandem bike and our single trail-a-bike. It took awhile for it to come in. The manufacturer didn't have any folding trail-a-bikes at first and then the bike had to ship from the warehouse in Canada. Then the bike shop needed more stuff from the distributor to make it worth while to ship the tandem trail-a-bike. The tandem trail-a-bike is an oversized package, whereas the single isn't. So eventually we got a call that it was in. It took about 6 weeks for us to get it. We ordered the folding tandem trail-a-bike, whereas we could have gotten the non-folding version a little sooner. I have no idea how you would fit the non-folding version in anything unless you have a huge vehicle. We can fit our tandem trail-a-bike in the back our of minivan when it's not folded if the back seats are down and we shove it between the seats in the middle row. We have also folded it and put in on a bicycle hitch rack behind the van. As I mentioned, we ordered ours from our local shop. You can also find the Adams Tandem Trail-A-Bike at Amazon for pretty close to the same price we paid. For your viewing pleasure, I'm including a video of the tandem trail-a-bike behind a single bike. I was able to get a movie of the kids riding behind their dad on our vacation to the midwest. Also, here's a link to my previous post about our maiden voyage on the tandem trail-a-bike and it includes 2 more movies of the kids riding it. Feel free to comment if you have questions. Also feel free to comment if you have a tandem trail-a-bike and what you think of it. Any other tandem couples out there? Wow! That's some impressive bike train! I'm considering how to get my two guys around these days now that the older is getting too big for the trailer. Do you think a tandem trail a bike is safer than a single trail a bike with a trailer behind? The younger would probably need to be in an Adams baby seat on the tandem, if that makes a difference. Hi! Thanks for stopping by! It all depends on who is pulling the train. Personally...I've tried to pull the tandem trail-a-bike and I can't (I should update with that). The kids and tandem trail-a-bike weigh more than I do. My husband pulls the tandem trail-a-bike and says it's a handful. I would say a single trail-a-bike with a trailer is safer, especially if the young one is still small. You'll get a good workout! When it's just me with the kids...I still trailer my youngest and my oldest rides his bike. Happy Biking! I'd love to hear what you end up doing. Thanks for the info! I bet I couldn't pull it either, then. Too bad, because it looks fun for the kidlets. Might be trying the trail a bike plus trailer, then. If I do, I'll let you know how it goes. Thanks! I'm really impressed. 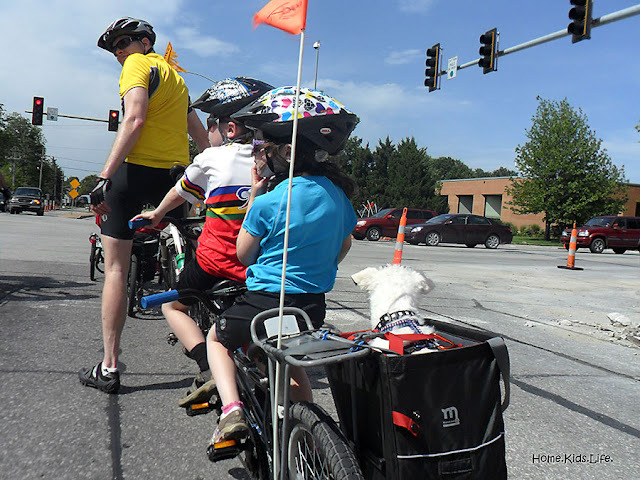 We don't consider ourselves bike enthusiasts but have done a few rides on our tandem decked out for the whole family; our 2 kids in a wee rider (between the front rider's legs) and baby seat on the back - and bob trailer. Sydney to Coffs Harbour was the longest. Never more than 100km a day. Just purchased a tandem trail a bike because the girls are too big for the baby seats. Plan to put the bob trailer at the end. Looking forward to some more adventures and tandem related arguments. Thanks for your page with photos. Great article .. very precise and informative. I'm purchasing a tandem Trail-a-Bike tomorrow and can't wait to get it out on the trails. We have 4 kids and a fifth one on the way, and I believe there is no better family time than to be out biking together. Unfortunately, our second child doesn't have the stamina to withstand long rides, so this product will most certainly fix this issue, having #2 & #3 on the tandem, and #4 in the carrier behind (or with my wife). Thanks again. I love hearing from all you that are getting tandem trail-a-bikes. (especially since you're not in the USA, like I am...thanks for stopping by!). I hope it works out for you. We're enjoying another year of our tandem trailer, but I think it's our last. Our oldest is going to be too big next year. Happy Adventures Biking! Nice to read this info. We have triplet four year olds and twin nine year olds and haven't figured out a way to go for a bike ride yet. This looks promising. The twins can ride their own bikes, but we could never figure out how to accommodate the triplets. I am thinking a tandem trailer bike behind my husbands bike, and a single behind mine might be the way to go. I don't think they would like sitting down "in" a trailer at all, but would love feeling like big boys. Thanks for the info! Would you recommend the single one have speeds or just one speed? Twipletsmom....thanks for stopping by and commenting. How fun that your whole family gets out biking! As far as a single with speeds (shifting) or one speed (no shifting), it depends on what you want to deal with and how much you want to spend. I'd make sure the child who is going to be on the single trail-a-bike is comfortable shifting first or eventually will be comfortable with it. If you're the one towing the child and want them to be able to help you more, then go for the trail-a-bike with multiple speeds. It makes it easier for the child on the hills, but they either need to know when to shift or be directed by you. The single trail-a-bikes that shift do cost more, so factor that into your decision. We only have a single speed single trail-a-bike (we got it thrown in for free when we purchased our adult tandem bike) and our daughter currently rides it when our son is on his single bike. It gets hard for her to pedal (or help) when we're on a big hill/mountain grade with the single speed, so it requires more of a workout on the adult's part. Not a biggie, since we anticipate it and it gives my husband or I a workout. I'd just make sure whatever bike is towing the tandem trail-a-bike has at least disc brakes or one drum brake if you have any big hills to go down. (We live in the mountains, so it's a must for us.) We have loved having a tandem and single trail-a-bike. Happy Biking! Thanks! No major hills and no mountains here. We don't bike much but would really like to start. We have a nice bike trail that goes for 60 miles and we live in a rural area and the kids always want to go biking. It just hasn't been doable wince the triplets came along...just when the twins were getting old enough to ride. I just ordered an Adams tandem for my hubby to pull and a single Burley Picoolo for me to pull. I went ahead with a shifter one so they could grow into it and maybe later we can keep suing it even when they are old enough to ride some on their own as a "rest" bicycle for one of them. Yay! How exciting for your family!! I'm sure you'll make many great memories out biking together! Have fun with it! And you can always have an "incentive" at home when the ride is done to reward your little bikers. My kids love something sweet for a job well done. Or we do a destination ride to a gas station that sells ice cream. Start slow and build up to bigger rides. Enjoy! We are a 3 childrens french family, 2, 4 and 6 years old. Last year, we rid along the loire river and were equiped as a single adulte bike with a follow me (http://www.followme-tandem.be/followme-tandem-avantages.htm) for the older son and a chariot corsair xl for the 2 youger sons behind my husband. It was a fantastic trip of nearly 900 km. Now, as we have the project to go biking again, the question is about the materiels. What would you advice ? a trail a bike tandem ? or a trail a bike single and a follow me behind ? Our second son is 102 cm tall. We wonder if he could even reach the pedals. Could you please tell me your opinion ? Thanks for stopping by and commenting. How wonderful that you all get out as a family and bike together. My youngest child was about 101-102 cm tall when she started on the tandem trail-a-bike, so I would imagine that your second son is tall enough. (My daughter was 5 at the time, she's short for her age and now about 104cm.) As far as deciding what to ride, it's what you and your husband are comfortable with. I cannot drive a tandem trail-a-bike behind my single, though I do okay with the single trail-a-bike. My husband does the tandem trail-a-bike. We use to hook up a single trail-a-bike and a carrier to our tandem, but I'm not familiar with the set-up of a follow me behind. Are you planning to still keep the youngest in the carrier? Could you hook the carrier up behind the follow me behind? Then the other adult could just pull a single trail-a-bike or another follow me behind. It takes a fairly strong/large person to control the tandem trail-a-bike. I'm 5feet 5 inches, about 115 pounds and I can't do it. My husband is 6 feet and 160 pounds and he can do it. I'd assume your husband would be driving the tandem trail-a-bike if you got one, so make sure he's comfortable with it. As your oldest progresses to a single bike and your younger up to the trail-a-bike, then a tandem trail-a-bike would be useful for you for a long time. Or you could pull a single trail-a-bike/follow me while your husband pulls the tandem trail-a-bike if your oldest still fits on one. 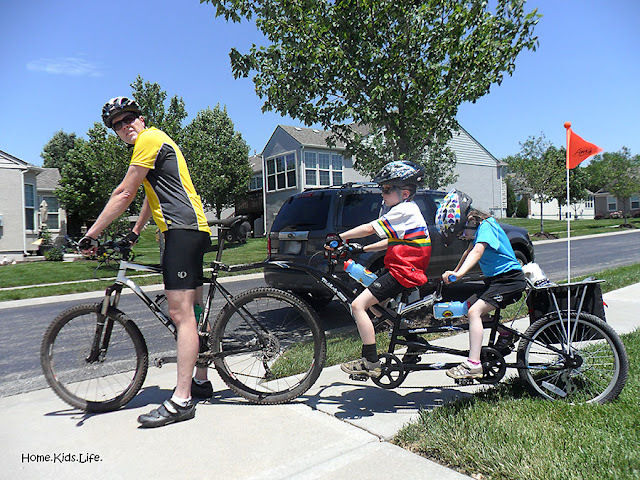 Compare what it would cost buying a tandem trail-a-bike versus another set-up and how long your children will use those set-ups. Plus evaluate whether you're comfortable using those set-ups. I'd recommend a tandem trail-a-bike if you don't mind the expense and if someone is comfortable driving it. We're going to upgrade to a second real tandem bike soon (our kids are getting too big for the tandem trail-a-bike and we already have a couple who wants to buy our tandem trail-a-bike.) and I'm much more comfortable driving a kid on a tandem than I am driving a bike with a single trail-a-bike behind mine. Another option is an extension kit on a real tandem bike. Do you own a tandem bike? They have extension kits so a child can pedal from the back. We had thought of my husband driving our tandem, using the extension kit for our son, and then he would trail our daughter also. But then I would go too fast for them on my single! I hope you can make some sense out of my longwinded answer. Basically...compare costs, what you're comfortable driving, and what will work in the long run (and whether you can easily resell what you buy.) I'd suggest the tandem trail-a-bike if someone is confident in their bike handling skills. Let me know if I can clarify anything else for you. Thanks! Hi. Thanks for sharing your experiences with the tandem trail a bike. I love hearing about families who all ride together. We currently use two single trail a bikes for my twin boys, but we've been looking into a double so my husband can still take them out without me. It sounds like you're almost done with yours. Would you be interested in selling? We've been having some trouble finding a place to buy the double. Hi, thanks for stopping by and commenting. I'm sorry, we sold the tandem trail-a-bike to some friends last fall. Our kids had outgrown it and we now own two tandems. 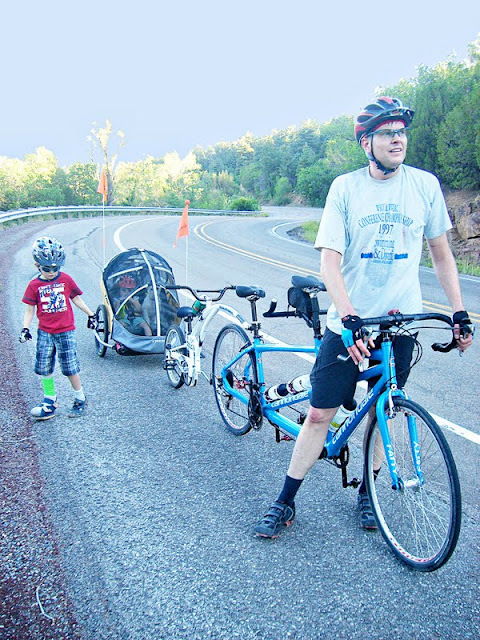 My husband and I each captain a tandem with a child behind us. We use crank extenders to help them fit in the stoker seats and pedal comfortably. We actually bought a second very nice used tandem for cheaper than a new trail-a-bike. Just a word of caution...they no longer make the trail-a-bike for various reasons, some of which we mentioned in the review. It is rather sloppy and moves around a lot, especially if the lead rider doesn't weigh enough. Apparently there was a warning that you need to be at least 200 pounds to drive the trail-a-bike (never saw that when we bought one). I wasn't anywhere near that, which is why I couldn't even get it to balance. My husband isn't even close to that, but he's a very good biker. On our tandem, we exceeded that...but I'm much more comfortable driving a tandem with a child behind me than I was ever being a stoker on a tandem with the trail-a-bike behind it. It is hard to find a used trail-a-bike, especially since they don't make them anymore. Maybe find a used tandem that you can hook a single trail-a-bike too and the boys can take turns on the tandem and trail-a-bike? I wish you the best of luck finding a set-up that works for your husband and kids! It's a wonderful thing to be out biking with the family! Love it! What great memories! Thanks for sharing. Hi. Where can I shop this tandem. Thank you. Adams Trail-a-bike sells the tandem trail-a-bike and others. You can look up their products at http://www.trail-a-bike.com/ You can look on their website on how to find a retailer that sells their products. We got ours through our local bike shop.